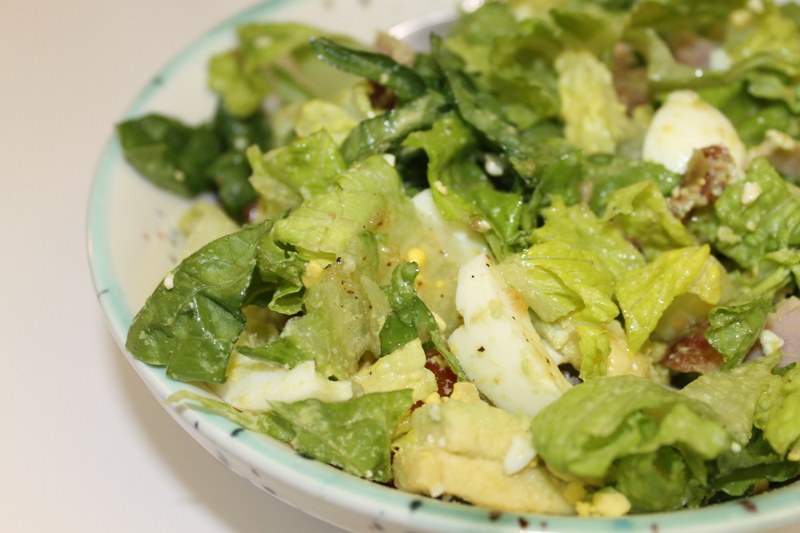 Apparently there has long been a dispute over who first created the Cobb salad. Whoever is running around trying to claim that they were the first to throw a bunch of meat and stuff with some lettuce together might have to find something else to do. As always, I just threw all my favourite ingredients together: blue cheese, bacon, avocado, eggs, tomatoes, ham. 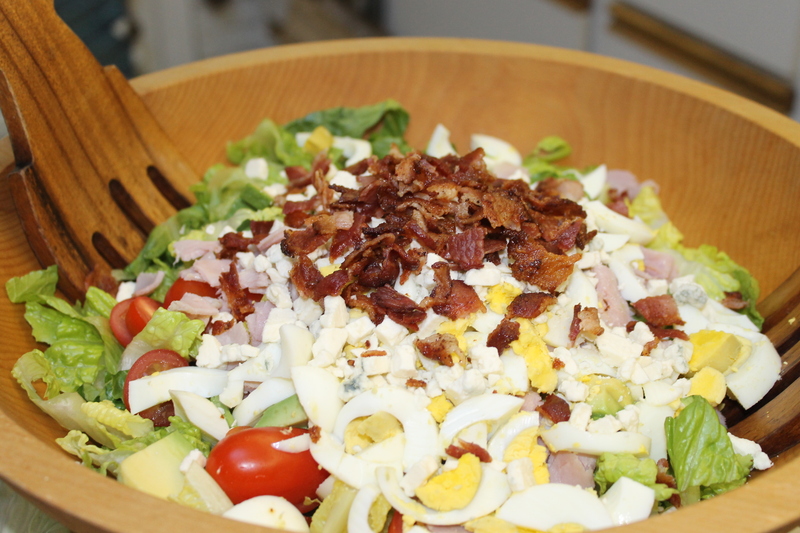 Maybe no one ever thought of putting blue cheese in a Cobb salad before… which clearly means I invented Cobb Salad 2.0! Or better yet the Allie Salad. Time to invade Wikipedia and record my fantastic discovery. Betcha that’s what the original Mr. Cobb said…well maybe not that he’d wiki it, but I bet he was gosh darn excited. 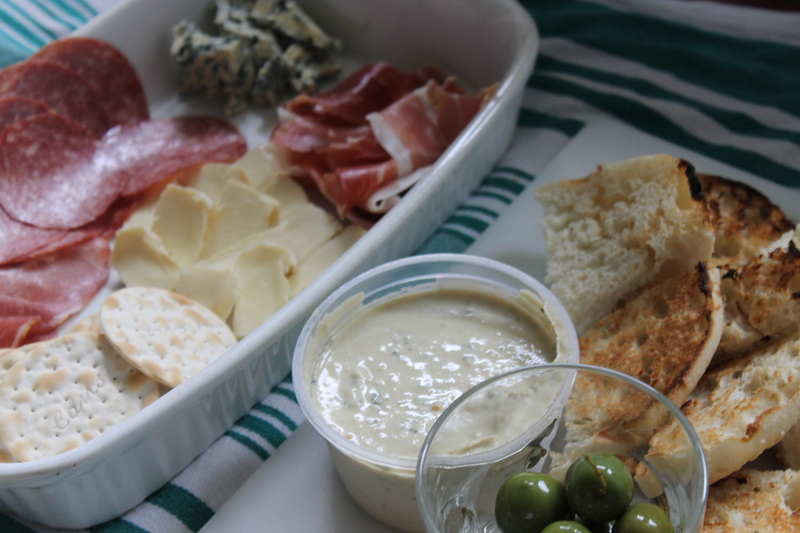 A charcuterie plate is something that is just as hard to pronounce (for me) as it is to actually make a recipe for. The word ‘charcuterie’ apparently comes from the French word for ‘cooked meat’ and in other words it’s really a fancy meat platter. A meat platter seems to be something different here though, namely the crazy tray of raw meat that you guys give away in pub raffles. Crazy Aussies. Though the day I finally win a meat raffle will probably be a great day. So no judgement. In the US a meat tray is usually something served at lunch and it will be a massive tray with an assortment of deli meats, ham, roast beef, turkey, bologna, etc. Then you’ll have some condiments, toppings and bread and you’re left to make your own sandwich. 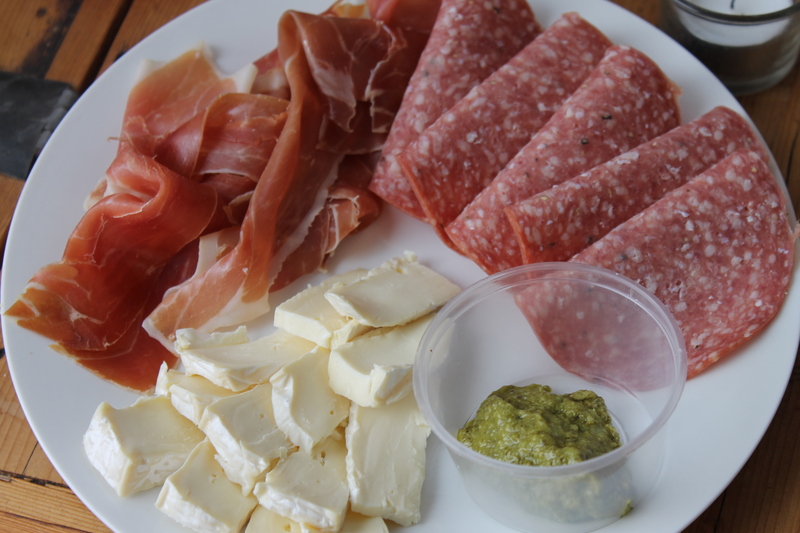 We went for the more French dish with some fancy jamon, some salami we found in the fridge, some brie and some pesto. A traditional charcuterie plate is supposed to have a broad variation of “fine cooked and dry cured meats sausages and pate with various acidic and savory garnishes.” Well, that’s a little pricey for a student so all you really need is about two types of meat, some cheese, a garnish of some sort and some bread. Serve with wine. Whether it’s lunch or dinner. And enjoy! This is one of those recipes that came up when we were trying to find a way to use up a bunch of almost-expired eggs. 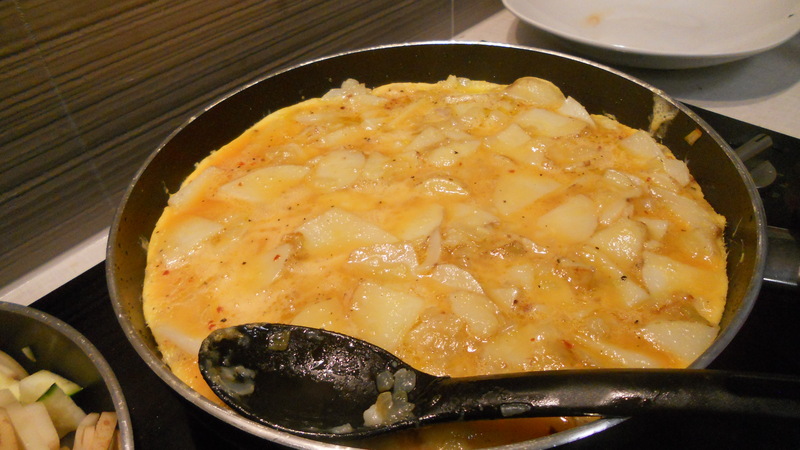 I don’t have a lot of experience with tortillas de patatas but it is very similar to a frittata, something a little more in my range of cooking knowledge. 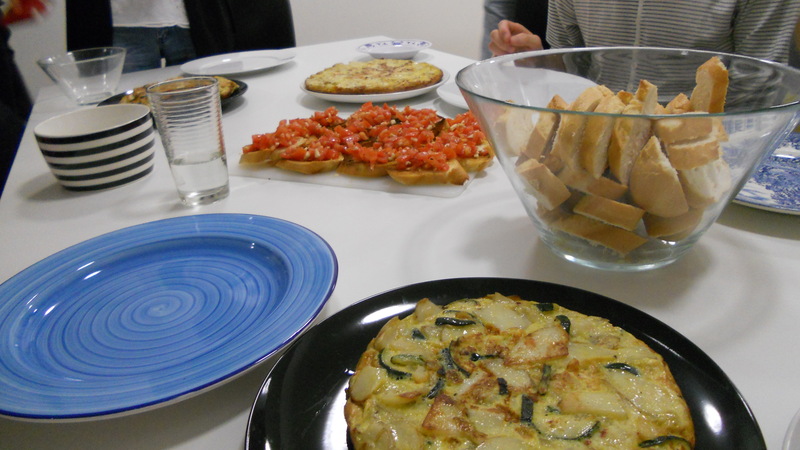 Tortillas de patatas is a great idea for a large meal, we were trying to feed 12 people and it was perfect for such an occasion. Translated it means potato tortilla, but it’s really more of a potato omelet, and it’s a very common dish in Spanish culture. 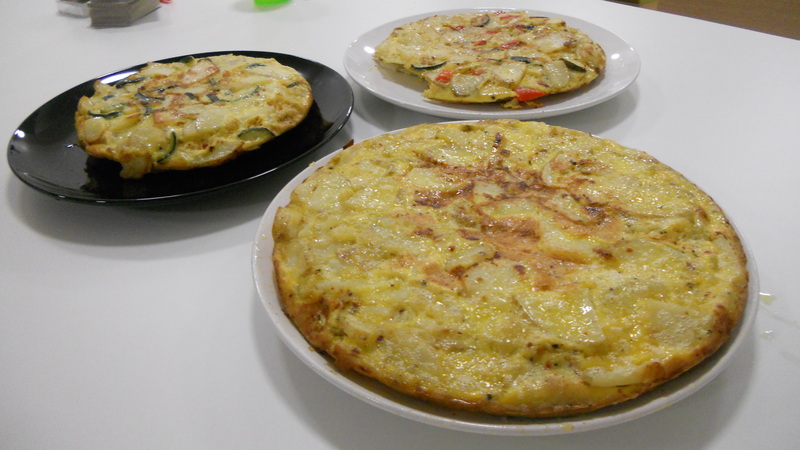 It’s also very versatile, the main ingredients are eggs, onions and potatoes and traditionally it is made with just those ingredients but we decided to stretch ours a bit and add zucchini, tomatoes and capsicum as well. 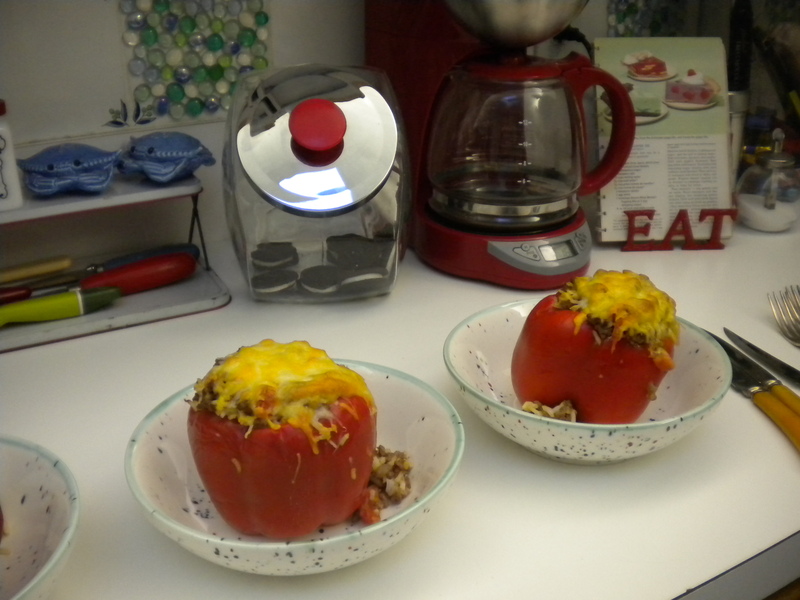 If you’re looking for a bit more flavor you could also throw in some cheese or meat, such as bacon or ham. Tortillas de patatas is a relatively simple dish, the only tricky part is flipping the tortilla. It does require a bit of skill and balance but if you’re really worried about it just use a small pan and the whole thing becomes much easier. We ended up just splitting everything up into four small pans so we would reduce the risk of broken and ugly tortillas. The recipe also takes a little while but if you get a bunch of people together to help out with chopping the potatoes and onion and everything then it goes much more quickly. Turn on some Spanish tunes and make sure you dance at least a little during all the slicing and cooking. Cut the peeled potatoes in half lengthwise. Then, with the flat side on the cutting surface, slice the potato in pieces approximately 1/8″ thick. If you slice them a bit thick, don’t worry – it will simply take a bit longer for them to cook. Peel and chop the onion into 1/4″ pieces. In a several non-stick frying pans heat the olive oil on medium high heat. Carefully place the potatoes and onions into the frying pan, spreading them evenly over the surface (this recipe makes several small tortillas so spread everything out into 3 or 4 frying pans). The oil should almost cover the potatoes. If you want to add some zucchini or capsicum in you can do it now. You may need to turn down the heat slightly, so the potatoes do not burn. Leave in the pan until the potatoes are cooked. If you can poke a piece of potato with a spatula and it breaks in two easily, your potatoes are done. Drain the mixture in a colander. 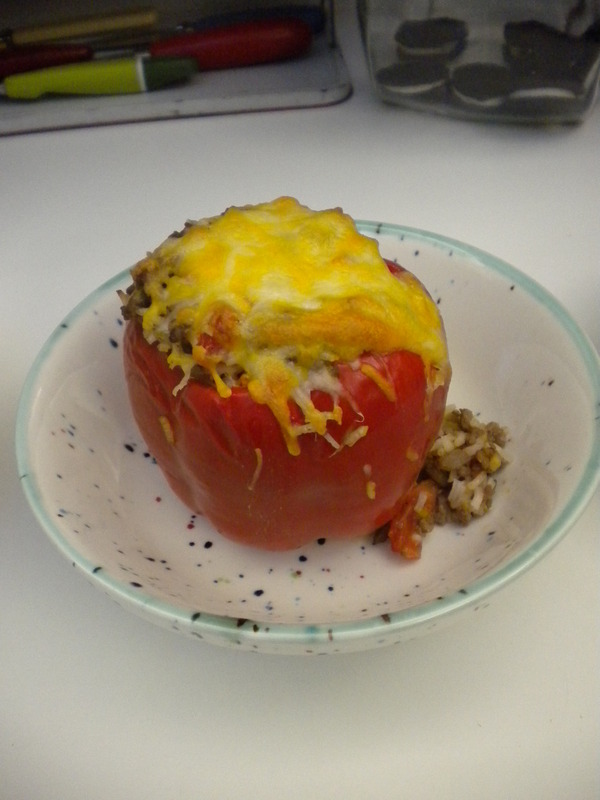 You can also drain it over a plate and save the oil for later. Crack the eggs into a large mixing bowl and beat with a whisk or fork. Add some salt and pepper and a bit of chilli pepper if you like a little heat. Pour 1-2 tbsp of olive oil into each of your smaller frying pans, and heat on medium heat. Be careful not to get the pan too hot or you may burn your tortilla! When hot, pour a little of the egg in, then some of the potatoes and onions, alternating until they are all in the pan. Press down on the potatoes and onions slightly so they’re covered by the eggs. Allow the egg to cook around the edges. You can also cover the pan in aluminum foil so it cooks more quickly. Then you can carefully lift up one side of the omelet to check if the egg has slightly “browned.” The inside of the mixture should not be completely cooked and the egg will still be runny. When the mixture has browned on the bottom, you are ready to turn it over to cook the other side. Take the frying pan to a sink. Place a large dinner plate (12”) upside down over the frying pan.With one hand on the frying pan handle and the other on top of the plate to hold it steady, quickly turn the frying pan over and the omelet will “fall” onto the plate. Place the frying pan back on the range and put just enough oil to cover the bottom and sides of the pan. Let the pan warm for 30 seconds or so. Now slide the omelet into the frying pan. Use the spatula to shape the sides of the omelet. Let the omelet cook for 3-4 minutes. Turn the heat off and let the tortilla sit in the pan for 2 minutes. Spaniards usually eat this as an appetizer and place a piece of the tortilla on top of each slice of bread. Usually they use smaller pieces when doing this but we just put our big pie-size pieces on the bread anyway.